USUALLY, to save time you have to take a ninety's minutes air craft flight to Nebitdag, then to go to Kumdag about forty kilometres by car; the next step is to drive further about a hundred kilometres sout- hward, along the road depressing with its monotonous sights, past desert and takyrs with poor flora, through vast valleys. There are the only two settlements on the way - Bugdayly and Madau. In the latter village it is worth getting a conductor, who may well be a good guide since the enigmatic ruins of Dekhistan lies in the vicinity. Dekhistan has also another name - Misrian. Together with the neighbouring ancient Mashad graveyard, Dekhistan is called Mashad - Misrian by Turkmens. Dekhistan or Misrian is not only an ancient city itself, but all the adjacent province, in other words - the Misrian oasis, which several centuries after inexactly known disaster, remained hardly noticeable signs. In this connection it is worth being noted that ancient monuments of history and culture were not the only things to attract attention of scientists of the 20 century to these lands. "Geomorphologists have been studying there processes of soilformation, - says academician Egen Atagarriyev, - geologists have been searching for oil and gas, geophysicians have been studying seismic activity, botanists - vegetable covering, economists and specialists from the Institute of Deserts have ascertained the perspective of opening up of the land of ancient irrigation in the connection with the building of Karakum canal". 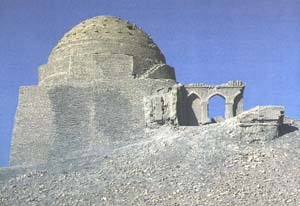 Atagarrieyw is an archaeologist and Dekhistan is the main object of his scientific research for more than a quarter of a century. Since 1970 he has run systematic excavations, has written several books, dozens of articles about this unique region, therefore it is clear that no one will find more competent specialist. There were collected sufficient facts, demonstrating that the lands of Dekhistan had been irrigated by humans for 3 thousand of years, it had not been a continuous process - there had been times, when the fields had been abandoned and reopened up again many centuries later. According to Egen Atagarriyev's classification, archaeological monuments of Dekhistan are devided into 3 historical epochs. The first one lasted from the end of the 3d. millennium ВС and prolonged to the 1st centuries AP. The tribes, which occupied this territory, went in for agriculture based mainly on artificial irrigation. The 2nd epoch - the early medieval one - embraced the 3-8 century. That was the time, when various cattle-breeding tribes, including ancient Turks, penetrated the land. Remnants of their settlements in the shape of huge fallen tumulus can still be seen on the vast valley of Misrian plateau. And, at last, the 3d epoch (10-14 centuries) left the most impressive signs. The ruins of medieval Dekhistan (site of encient settlement of Misrian) is the most important monument of all the south-western Turkmenistan. It is the place where the antiquity lovers and scientist have aspired to visit to for a few decades. "The first European, to visit the ruins of Misrian in 1836 was a British traveller, Arthur Connoly, - tells E.Atagarriyev - Unfortunately, he did not leave any description of the monuments, which at that moment were sounder than today. Almost 30 years later a cemal caravan passed through the valley carrying, besides its usual load, a foreign traveller, - Hungarian orientalist Arminiy Vamberry, which was taking the journey incognito, later on he published a book about his dangerous trip to Central Asia and in it concerning Dekhistan part of his travel he pointed out two high towers (minarets) of damaged to some degree erections (obviously mausoleums of Mashad), and also a grand aqueduct". Afterwards the region was visited by several explorers, but only in 1902 virtually scientific research of Dekhistan began. Before describing the architectural monuments we shall have a look at the city itself, whose territory stretches for two hundred hectare. Like most cities of its epoch, it was devided into well-fortificated shakhristan with citadel (the most ancient part of the city) and rabad around it (a densely populated trade quarters with bazaars and caravanserais). According to Atagarrieyev.shakhristan was protected with two rows of high fortress walls with semi-round watch-towers. The outer and inner walls were parallel and the space between them was separated with auxiliary walls into compartments which served as traps for enemies. The city was in its prime being a possession of Khoresm Shahs, then destroyed by Mongol he revived and finally fell into decay with decline of irrigation in the 15 century. Its architecture remained only a few fragments of the erections made of bricks and having great artistic value as the glaring examples of Islamic architecture. The first and foremost is two 20 metres high minarets. In all probability it is a half of their initial height. 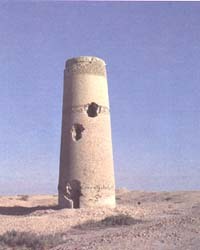 Abu- Jafar Akhmed minaret, so called "not- hem" - was built by architect Abu Bini Ziyad approximately in 1004/05 together with a mosque which is entirely ruined at the moment. Smooth surface of the minarets was girdled with two belts of Arabic scribings which were engraved on the bricks. The scribings tells who and when has erected this monument. The top of each minaret was crowned with wide belt of geometrical ornament. 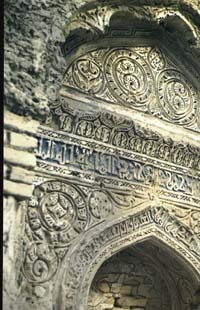 The second minaret (7 metres in its foundational diameter) was built 120 metres away from the first one,but almost 200 years later, at the corner of mosque of Mukhammed Khorezmshah which remained only two pylon of 18 metres high portal with luxuriant ornament made of engraved bricks with insets of blue glaze. The predominant part of the ornament is vegetably stylized motifs and Arabian inscriptions, where the names of Khorezmshah and the architects were written. On the site, there were found remnants of foundations of four preMongol mosques (two-in shakhristan and two-in rabad). As it was mentioned before, seven kilometres northward from the city of Misrian, there is Mashat (Meskhed) graveyard. Today one can see there five half-destroyed nameless mausoleums of the 11-12 century, although in 1947 there were seven and in the 19 century - about twenty of them. Among them the best preserved monument is a mosque-mausoleum Shir-Kabir. It is also called Mashat mausoleum, however presence of mikhrab (special bay in the main wall, which was directed toward Mekka) serves as a vivid proof its being a mosque first of all, besides it is the earlist moslem mosque that remained up to now in Turkmenistan. Specialists date it from the 9-10 century. It is mikhrab with its luxuriant ornament that is considered to be the main sight of that small but truly unique erection. Formerly, a long caravan course from Khoresm to Girkania (Gorgan province in Iran now days) ran through Dekhistan. Ruins that lies on the course is an evidence that there were many occupied settlements, concentrated around Misrian and formed its agricultural neighbourhood with highly developed system of irrigation. A medieval Arabian historian, al-Makdisi pointed out twenty four settlements of Dekhistan, in fact however there were more than that and it was demonstrated due to the expedition of Atagarriyev. Highly developed fortification, artistic quality, performing technics and quality of the monuments of Dekhistan make this provincial region peer to such capital centres of medieval urban life as Merv, Koneurgench, Samarkand. Moreover, unlike cities of Khorasan, with its predominantly adobe-made erections, in Dekhistan burnt bricks were widely used - not only in public buildings, but also in dwelling houses of common citizens and in erection of fortress walls. In accordance with academician Galina Pugachenkova, an outstanding explorer of Central Asia, familiarity even with less number of monuments of Misrian and Mashad shows that architecture of Dekhistan had undoubtfully its own characteristic appearance, its own features, its style. Why had Dekhistan died? This problem has been interesting for many explorers for a long time. Despite there is no vivid proof. Mongols might have possibly damaged the oasis. But the total part in this region's destiny was taken by the inhabitants of it, which broke ecological balance. Year after year, century after century they had been chopping the dence forests on the sloped of Kopetdag for fuel and house building. On those slopes there were a lot of delta channels of Atreck river running down to the valley. Huge plots of woods were burnt by shepherds to enlarge pasturable areas. As a result, according to specialists of the. Institute of Deserts of the Science Academy of Turkmenistan, formerly wooded slopes had mostly turned to treeless areas with greatly eroded soil, so called "lunar landscape". In the Middle Ages the thinned out forests ceased fulfilling their water preserving function, and that led to the catastrophic consequences. My eyes are covered with slumberous mist, // Illusions have bound my speeches. // And far Dekhistan has blown with warmth, foul weather's dispersed those winds. Unbroken silence among the ruins and ashes, which is usually so typical for abandoned cities, will have not only poets, but everyone think of the perishability and ephemeral essence of life, that goes away leaving no erections but scattering of ostracons and shapeless ruins, that have been before something useful, firm and splendid. What a luck for an archaeologist to find thore pieces of the former magnificence, occasional snatches of sayings in the form of Arabic lingatured scripts on the wall on the piece of ceramics. Sometimes, very seldom, one can find an unbroken or even unique item, it may be an ancient vase, ornamented dish or mysterious statuette. Those, who conducted excavations in Dekhistan have found a lot of items, which helped to shed light on the history of this marvellous area. And those, who will come later, being knowledgeable of this story, will see the majestic and instructive picture of human and nature's confrontation. Siyakhat is a reliable partner and always guarantees a high class service. We invite you to visit independant neutral Turkmenistan. This site is best viewed with Microsoft Internet Explorer 4.0 and higher.